Using a cheap, fixed focus digital camera eliminates the need for the camera to find focus. This assembly was placed at the prime focus of a 5", f/10 Maksutov. The 89% full waxing gibbous Moon was imaged in a set of 7 overlapping areas. A 5s delay was used so that any vibration caused by pressing the shutter had time to die down. The camera was set to monochrome, and 10Mp resolution. The 7 resulting images were stitched together into a mosaic using Microsoft ICE. The image was reduced in size and flipped horizontally to correct the orientation. Using a fixed focus camera ensured that all of the focusing was done with the telescope focuser. A mobile phone (Sony Ericsson C902 Cyber-shot 5Mp) camera was used afocally with the LX200 SCT at the Fairwood observatory, to capture images of sections of the Moon to good effect. 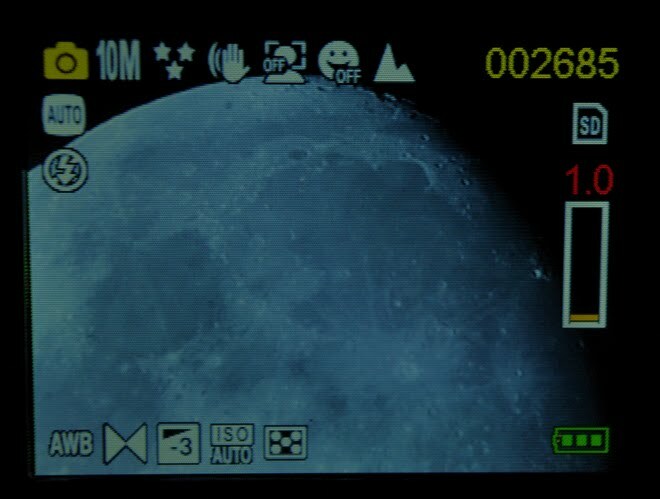 This again demonstrates that some mobile phones have cameras that are well suited to afocal astronomical imaging. A Pentax K-x DSLR was placed at the prime focus of a 5", f/10 Maksutov and an image was captured of the Moon in the daytime sky. A Philips SPC880NC/900NC camera fitted with a UV/IR cut filter and a 2.5 x Barlow was attached to a 5", f/10 Maksutov. Seeing was 2 on the Antoniadi scale. wxAstrocapture running under Linux was used to capture an 1800 frame AVI at 10fps.